The monthly Android version distribution numbers are up for September on the Android Developers site, and things appear to be moving just the way you'd expect. Month over month, we saw a 2.2% decline in share for Gingerbread, a drop of 1% for Ice Cream Sandwich, 1.4% for Jelly Bean 4.1, and small gains of 0.9% and 0.1% for Jelly Bean 4.2 and 4.3, respectively. 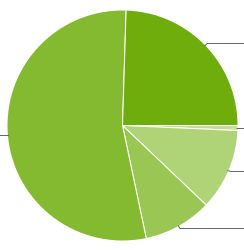 KitKat was this month's biggest mover, adding 3.6% to its share of the pie, bringing it to 24.5% of all Android devices active in the last week. This is an increase in pace compared to last month, when it added only 3%. Froyo remained at a stubborn 0.7%, but KitKat's advancement has remained pretty steady since May of this year, adding 3-4% consistently each and every month. Now that many devices are being released with Android 4.4, especially in the budget segment, we can only expect this pace to quicken over the holiday phone-buying season. While Android "L" may see a release in the coming months, it'll be unlikely to make a dent in market share for a solid quarter or two following its release, as has historically been the case with new versions of Android. To see the full stats and more, headed over to the Android Developers site below.